When you think of ways to protect yourself and your family, you don’t usually think of going to the kitchen. But did you know a powerful weapon of protection could be in your spice cabinet? 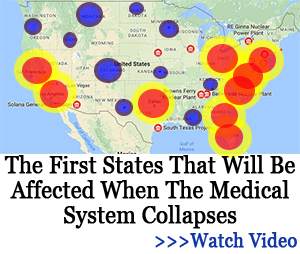 As you prepare for a possible crisis, you must think of all scenarios including a loss of access to health care. You need to be prepared for protecting yourself from a variety of diseases and infections when running to the doctor is no longer possible. Instead of stocking up on pharmaceuticals that can expire and lose their potency, look in your spice cabinet. One of the most potent spices in your cabinet is cinnamon. Cinnamon has ancient roots in both Eastern and Western medicine with use recorded as far back as 2,000 BC. Cinnamon was prized as a preservative and as anointing oil. There is also a long history of cinnamon’s medicinal use in Asia. Cinnamon is ranked by researchers as the #1 medicinal spice in due to its antioxidant properties. Cinnamon won’t protect you against zombies or miraculously solve world hunger. It’s not that powerful! But studies are showing an increasing list of ways that cinnamon can improve your health. This simple and ancient spice deserves a spot in both your kitchen cabinet and your medicine cabinet. Cinnamon, that nostalgic spice of grandmas and bakeries, can be a lifesaving tool. Here are 10 health benefits of cinnamon that may surprise you! That distinctive smell of cinnamon that reminds us of Christmas is caused by the compound cinnamaldehyde. Cinnamaldehyde is found in the oily bark of the cinnamomum tree. Cinnamaldehyde produces not only a delightful smell and flavor but also can damage the cell membrane of deadly infections like E. coli and Staph Aureus effectively clearing the bacteria from your body. 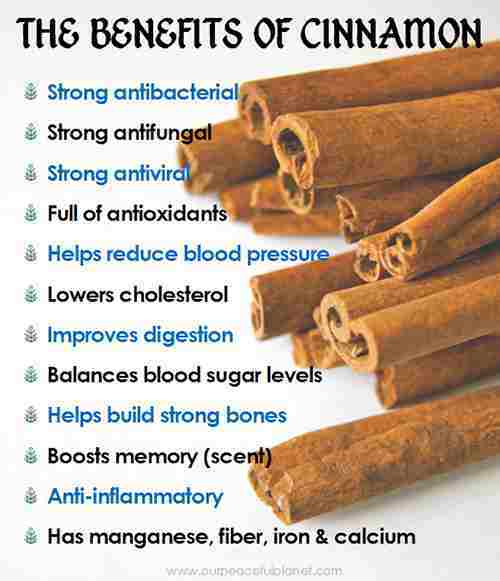 Cinnamon is also able to ward off respiratory infections that could otherwise disable you. Antioxidants are a compound that help to decrease the damage done in your body and to slow the aging process. Antioxidants are often found in berries, red wine and dark chocolate. You might not be able to carry those treats in your bug-out bag but cinnamon also contains high levels of polyphenols, phenolic acid and flavonoids. Studies show that the use of cinnamon increased the levels of antioxidants in the kidneys of rats. Stay healthy and look younger. Not a bad combo! Diabetes often requires regular blood sugar monitoring and the use of medication and insulin. Things that may be hard to come by when SHTF. Cinnamon has shown in studies to have a beneficial effect on blood sugar control. This is thought to happen by improving the body’s response to the insulin hormone which balances out blood sugar levels. A study conducted in 2009 showed that taking 500 mg of cinnamon twice a day for 90 days resulted in consistently healthier levels of hemoglobin A1C levels in people with type 2 diabetes. Another study showed reduced serum glucose levels and improved cholesterol levels. Inflammation of all types can slow you down and prevent you from functioning at your best. Swollen joints, sore muscles or severe allergic reactions are all signs of a distressed body. Cinnamon decreases the amount of nitrous oxide in your muscles which leads to lower levels of inflammation. Cinnamon’s high levels of antioxidants also help to decrease the amount of swelling and allows the body to recover quickly from injury or stress. Cancer is an attack on the body from within, your own cells start to mutate and grow beyond their healthy limits this results in tumors and damage to your DNA. This fight within your body can be decreased with the use of cinnamon. Studies have shown the regular use of cinnamon slowed the growth of breast cancer cells by 32%. Cinnamon has also had a protective effect against colon and liver cancer by binding to damaging bile salts and removing them from the colon and liver. A cavity or two won’t appear as the worst of your problems but a toothache can leave you distracted and in pain for days. Cinnamon oil has been shown to be effective against infections in the mouth as well as 10 different strains of bacteria that cause dental cavities. Cinnamon also is effective in treating halitosis (bad breath) and healing mouth sores caused by bacteria. A candida yeast infection occurs when the flora of your system is disrupted and allows the naturally occurring candida yeast to overtake sensitive areas such as the digestive tract. Yeast infections can be triggered by poor sanitation, stress and unbalanced diets. Doesn’t that sound like a SHTF scenario? Cinnamon helps by increasing the health of your immune system and reducing inflammation in your digestive tract. As well as acting as an anti-fungal directly affecting the Candida cells. When your body is functioning optimally, your chance of infection is greatly reduced and your chance of survival increases! Glowing skin might not be high on your list of survival needs but it is a nice side benefit. Cinnamon mixed with honey can be used to prevent rashes, allergic reactions and infections. As well as help clear up annoying acne, rosacea, redness and swelling. Cinnamon’s anti-biotic and anti-microbial abilities guard your skin from irritants and naturally increase your skin’s health. As the largest organ in your body, healthy skin goes a long way to keeping you healthy. You all know that a good ticker is vital to your ability to keep on going! It is a good thing that cinnamon works directly to protect this organ too. How cinnamon works to increase your heart health is by reducing your levels of LDL or bad cholesterol and stabilizing your HDL or good cholesterol. Also, cinnamon may reduce high blood pressure which decreases your chance of heart disease or stroke. Cinnamon antioxidant effects include increasing your body’s ability to heal damaged tissue. That includes your heart! Your most powerful means of protecting yourself is the use of your brain. Let’s keep that brain strong. Research has shown that cinnamon can fortify the brain against the development of diseases such as Parkinson’s and Alzheimer’s by reducing the amount of damage to the cell structures in the brain. Another result of the powerful antioxidant and anti-inflammatory property of cinnamon is that it slows the impact of stress on your brain. Reduced mental stress helps your brain to function at it’s best. Just the smell of cinnamon can increase your brain activity! A study in 2004 found that people who smelled cinnamon performed better at tasks involving attention, virtual memory recognition, working memory and visual-motor response speed. That means you can move faster, remember more and concentrate better after smelling cinnamon. It could replace your morning cup of coffee as a brain stimulant! Are you convinced? Ready to stock your shelves with a few extra jars of cinnamon? Ceylon cinnamon, often called true cinnamon. The flavor is sweet and light. Cassia is also sold as cinnamon, it has a darker, stronger flavor. Saigon cinnamon is the most valuable variety and has a full flavor. And a huge price tag! Both Ceylon and Cassia will have similar health benefits. Ceylon is a sweeter cinnamon that tends to have more cinnamaldehyde, the property of cinnamon that has been studied for it’s health benefits. There has been some concern with the level of coumarin, a mild toxin, in Cassia. Although this is only toxic at high doses. A teaspoon (1 gram to 1.5 grams) a day of either Ceylon or Cassia cinnamon is thought to be safe. To receive the most benefit from your daily dose of cinnamon, you will want to grind your own from fresh cinnamon sticks. You can buy in bulk from a local grocery store but most will not have a harvest date. That means you won’t know how fresh your cinnamon is! You can buy online from sites which source fresh cinnamon and have clear harvest dates. Fresh cinnamon sticks will last about 1 year and are damaged by light and heat. You will want to store your supply of cinnamon in a sealed container and keep it in a cool, dark place. You won’t need to be told how to take your daily dose of cinnamon! A sprinkle on your oatmeal, a little in a warm glass of milk, a savory curry, mixed with yogurt or gather your baking supplies and whip up a batch of fragrant cinnamon buns. These delicious treats can be served to family (or enjoyed in solitude) knowing that you are providing a surprising array of health benefits. There are concentrated 500mg cinnamon capsules available also. I make a tincture from cinnamon bark I purchase at Mountain Rose Herbs. It is especially good in coffee or your beverage of choice. So is it more beneficial to get the sticks and grind them or just get the powder form in cans in the spice section on grocery store. Thinking about filling capsules with cinnamon like filling with turmeric as a previous article describes. Most commercial forms of cinnamon powder are really just saw dust flavored with cinnamon oil, a process invented by “Masterfoods” but now is very common, buy the sticks and grind them yourself, local cinnamon is good, but if you can find Indonesian cinnamon, its better. The sticks are bark. How would one ‘grind’ them? Using what? Wheat grinder? Certainly not a blender.